We’d love your help. Let us know what’s wrong with this preview of Rescuing His Secret Child by Maggie K. Black. To ask other readers questions about Rescuing His Secret Child, please sign up. This was a new to me author. Full of suspense. A train hijacked with a soldier on board. A soldier who meets his five year old son for the first time. I enjoyed it very much. Building up tension and believable suspense and action in a small confined space, that is moving across the Canadian wilderness could be a challenge, yet the author manages to bring up the intensity from the very start, and hold it h What a lovely story! I haven't always enjoyed Love Inspired books, but I feel like recently the quality of the writing has improved drastically, so I'm more willing to give them a chance. The description for Rescuing His Secret Child caught my attention, so I decided to give it a go, even though the title kind of makes me cringe! Fortunately, the book is much better than the title! Rescuing His Secret Child takes place over a period of maybe 24 hours (except for the very end of the final chapter, which is set a few w I haven't always enjoyed Love Inspired books, but I feel like recently the quality of the writing has improved drastically, so I'm more willing to give them a chance. 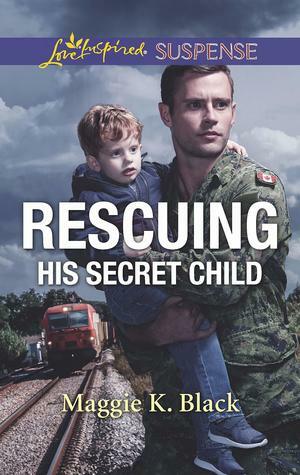 The description for Rescuing His Secret Child caught my attention, so I decided to give it a go, even though the title kind of makes me cringe! Fortunately, the book is much better than the title! Rescuing His Secret Child takes place over a period of maybe 24 hours (except for the very end of the final chapter, which is set a few weeks later), and that short time period really helps to build the suspense. While I'm normally not a fan of romance in suspense novels that are set over a short period of time, it helps here that Nick and Erica have a history, so the speed at which their romance moves feels authentic. Zander, Erica and Nick's son, is completely adorable (if perhaps a bit unbelievable for a five-year-old), and his growing relationship with Nick was really sweet. I did pinpoint the mastermind behind the train heist fairly early on but not his motivation, and it was fun to see it all unfold. This is a quick, suspenseful read that I found to be really enjoyable. Also, I believe this is one of the only books I've read set in contemporary Canada (besides Liz Johnson's Prince Edward Island Dreams series), so it was a fun setting to dive into. This Romantic Suspense is fast-paced and action-packed. I liked the unpredictability of the many plot twists. I really liked the gutsy heroine and the hero who stepped up when it mattered most. I appreciated that these two characters did not overindulge in self-recriminations and regrets about their pasts, shared or otherwise (because numerous repetitions of this kind in many books of this genre tend to annoy me thoroughly).